We’re pleased to announce a second milestone release of Spring Statemachine 1.0.0.M2. With this milestone we focused on features in regions and pseudostates. Regions provide more sophisticated functionality for a parallel execution of a states machines and pseudostates will bring more functionality for working with initial, terminate, history, choice, fork and join states. One might ask what is a region and how it works with a state machine. A state machine is a specialization of a region where orthogonal regions are composed of a multiple independent state machines. This is a difficult concept to understand so we did a sample to demonstrate this feature. Above statechart is showing a usual concept of how a group of tasks are executed during a workflow. Executing a multiple tasks means that if one of these tasks will fail, executing of tasks again cannot continue unless a failure reason is fixed. These failures can be either fixed automatically or state machine is put into a manual state where user level intervention is required. Only after that a state machine can go back to its main state where all tasks can be executed again. 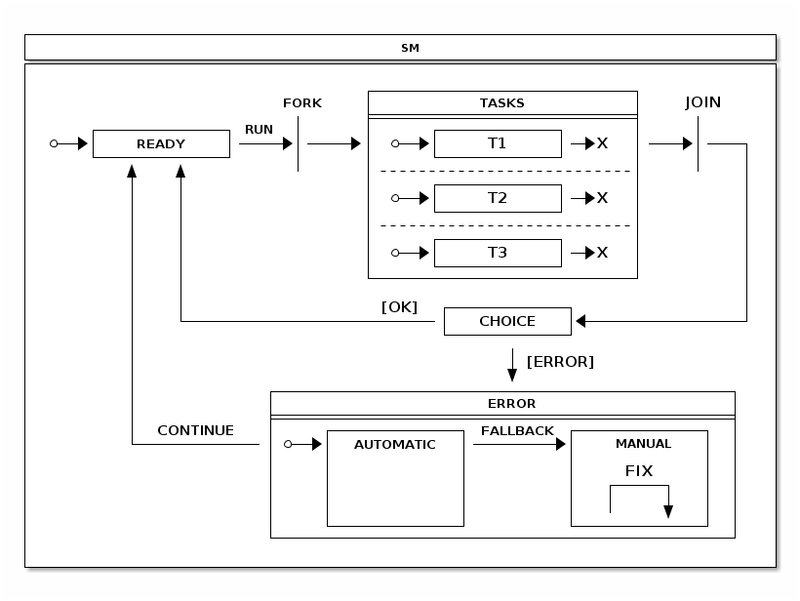 One useful concept in a state machine is a history state. This pseudostate is recording last active state of a statemachine and returning into that state will restore active state configuration. 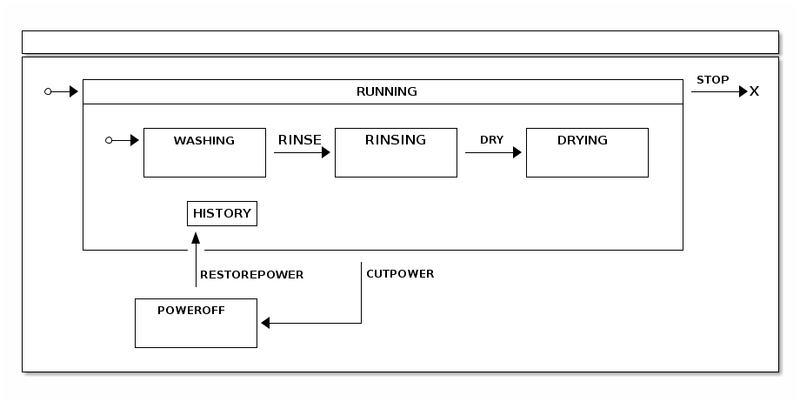 Concept of this is shown below(we know that washer is able to continue from its last state when power is restored) and more detailed description can be found from a reference documentation. Relax requirement of using enums for states and events. Adding error handling for state machine execution. Better support for Spring SpEL for actions and guards. Better programmatic instantiation of a state machine. New concept of using a recipes for easy state machine usage. Tasks example above is a good example where we can provide recipes for usual state machine use cases.